Carla Reiter: Not Your Grandmother’s Knitting! I am fascinated by the process of knitting with metal! There’s just something about it that seems so absurd that it appeals to me. I make my own crochet cuffs, earrings and necklaces and have numb fingers to show for it, but when I stumbled across the work by Carla Reiter on the Smithsonian Craft Show website, I saw knitting with metal taken to another level entirely. Carla won the 2008 Bronze award under the First-Time Exhibitor category; an incredible honor among world-class jewelry designers. Carla’s work is astonishing! I began knitting wire because I imagined a necklace that was like a simple wiggly line drawn around the neck and I needed to figure out how to make it. Knitting made sense. (I still make that necklace and still like it.) I’ve been developing the technique for more than a dozen years, expanding it, and figuring out ways of combining knitted elements with fabricated ones. I like its combination of randomness and structure. I like the way it feels on your body – surprisingly soft and caressing. I like that its hollowness allows me to make big sculptural forms that are still very light and comfortable to wear. And I like its organic, just-excavated feel. I guess I’d say my style is very earthy, very handmade – a blend of chance and intention. I’m not a “technical” jeweler in the traditional sense, though I have learned enough traditional technique to do what I need to do. My style is a reflection of my impulse to just make the thing and put it on my body. All my work is made with a woman’s body in mind. While I’m working, I’m constantly trying the piece on, tweaking the way forms interact with my body – a collarbone, a wrist bone. When the piece is lying on a pad being photographed, it’s flat. Something crucial is missing: it needs a body to complete it. I’m not sure I can say in a simple way what I learned in 20+ years of working and living in the non-jewelry world, or how it changed the way I make jewelry. I’m an intellectually curious person and was somewhat restless. So I just followed my interests and went as deeply into each of them as I was able. I spent a lot of time in universities, and with scholars of various kinds. In addition to learning something about the particular subjects (art, physics, science journalism, cultural anthropology) I guess I’d say that I learned that keeping one’s mind open makes life much more interesting. I discovered a real love for, and awe of, the natural world in all its subtlety and variety. I learned how to think in ways that were contrary to my automatic ways of thinking. I learned to change. I decided to try to make jewelry full-time because I wanted my mode of earning a living to be as direct and honest a reflection of “me” as I could make it. It sounds strange, but it had to do with wanting to feel honorable about what I did for a living. Not that writing and journalism are in any way dishonorable; they just felt somehow like roles I was playing. I didn’t want that feeling. I have been a maker of things my whole life, whatever else I’ve been doing at the same time. And jewelry has been a love since childhood. As a maker of jewelry, I feel that I am part of an honorable tradition of artisans and it feels good – it feels right. It doesn’t necessarily satisfy my intellectual hungers, but I do that in other ways. The present state of the economy is hard on everyone. Jewelry, after all, is a luxury. Middle class collectors — people who might have spent $400 – $500 on a bracelet a few years ago — aren’t so likely to do that now. 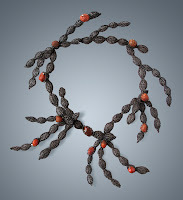 There are still a few collectors who can spend $5,000 or $6,000 for a necklace. But everyone is being very cautious. Understandably. You asked for my advice for beginning jewelry designers. I don’t feel very wise. However, I’ll give it a try. First, make your own work. By this I mean, make work that really comes from you – your sensibility, your taste, the things that excite and please you. It sounds stupidly simple. But when you’re new in a business and surrounded by people who seem to be successful, it’s very easy to look at what they’re doing and say, “Hm. If I just do that.” Resist the temptation. Do what your mom always told you to do: Just be yourself.Second, don’t under price your work. Everyone does it, of course. But don’t. You will feel insanely presumptuous charging a proper price for it. You’ll think, “But it’s just little me and it was fun to make it and no one knows who I am” and on and on. Wrong. Pay yourself for your materials and your labor and the cost of running your studio and absolutely everything else that goes into making your work. And don’t apologize for it. I love Carla’s unusual and stunning work. And her advice on pricing is so important! In 26 years of business at my own video production company, I wouldn’t have dreamed of not charging what the video was worth….but as I venture into jewelry, I’ve under priced every time. I learn so much from everyone I profile and I’m going to keep Carla’s words in my mind from now on. Carla’s work can be seen at Carla Reiter Jewelry and in person at the Patina Gallery of Santa Fe, NM. She’s also got a collection arriving at SOFA in Chicago as of November. 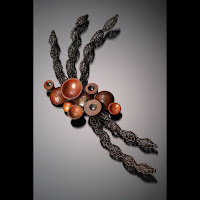 Previous post: Nancy Troske: 30 Years of Beautiful Chains, Enamel and Granulation! Next post: Joyce Roessler: Glass, Glorious Glass!